This is a TOP adress in Mykonos and i will for sure come back here when i return. the value for money is incredibly good, the whole place and the rooms are in perfect condition, with beautiful charming details, the hosts are incredibly friendly and helpful and the breakfast is the best way to start your day. it is just 2 minutes walk to the main city center, and that is perfect as it is so quiet at night which you would never get right in the center i cannot recommend this place highly enough. Excellent location and fantastic service. They treat you as family and are super accommodating. They made my stay as a first time solo traveller much easier. My room was super clean and equipped with all basics. The only thing I’d change is the red lights bulbs in the room but this is just a matter of taste. Would recommend this place to anyone visiting the lovely city of Mykonos. What a gem! His place was very comfortable, clean and located just a three minute walk to fabrica which is the bus station and the windmills. What a great location close to everything! I really enjoyed my stay at Adriani's. It is only a short walk to the main town in Mykonos, the accomodation was clean and the staff were very friendly and nice. The outside courtyard area is also very nice. Would definitely recommend staying here. Had a great stay here - Andriani kindly picked me up from the ferry port herself. She is very sweet and has the cutest little dog! The room was very clean and the addition of air conditioning was a blessing! Would highly recommend. I stayed at Adriani’s for a couple of nights in early June 2018. The hosts were incredibly welcoming and warm. The rooms were well appointed and clean. Breakfast is well worth your while, a lot of quality fresh food for a good price. I wanted to stay on an extra couple of nights, however they were booked out. The host organised alternative lodging for me nearby for cheap. Happy customer, would highly recommend! 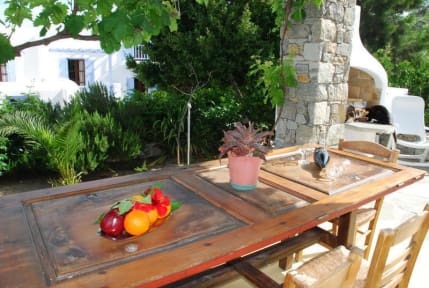 Really excellent place for Mykonos - very reasonable price and super clean facilities. The breakfast was seriously incredible. 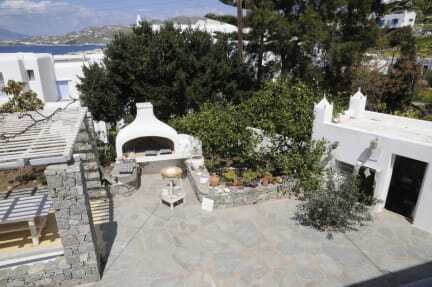 Adriani's guest house is a very good choice for those wishing to stay in a central location at Mykonos. a short downhill walk away to fabrika square for buses to select beaches such as paradise, super paradise. A few minutes walk from little Venice, the old port , the famous shopping streets and iconic windmills. Host Antonio is very responsive to all my questions and needs - I communicated with him via texting during my stay. He drove me to & fro the new port for my ferries. comfortable room. I enjoyed my stay here. The place is cute (look for the cats in the rafters outside) and comfortable. The staff was good about giving me rides from the port and to the airport, and responding to emails. They seem to only be in reception if they're scheduled to check someone in, so definitely try email to communicate. The wifi was very good. I spent two nights in a single room and had a comfortable and relaxing stay. Everything was clean and the staff were friendly. The main bus-stop and heart of the town were just a short walk away.